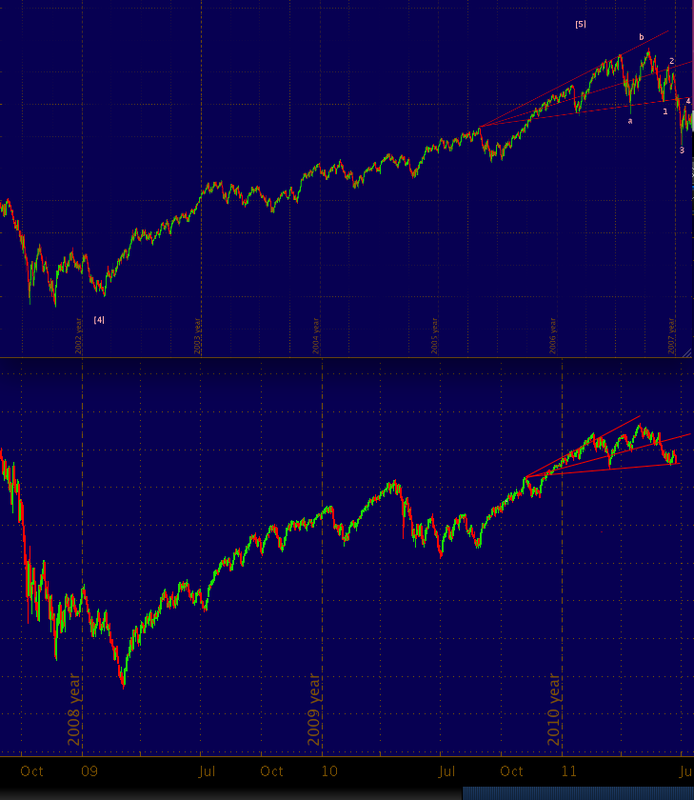 I view 2007 as particularly similar to the current market. In my opinion, we’ve completed wave 1 of (1) down and are in the process of tracing out corrective wave 2, which should take us back to the midline of the channel created over the past four months. After the 10/11/2007 peak, that market dropped 10.8% in 31 days. It then recoverd to its channel midline in just 11 days. This market took 32 days to drop 8.2% to its recent low. It had retraced 35% of its total decline in 4 days before plunging back near its lows late last week. A return to its midline of about 1326 would mean a 61% retracement of the total drop. It has 5 days to complete the climb if it’s to match the 2007 pattern. 52 points in 5 days. At 21 days down from the May 2 top, this market retraced 58% of it’s then 4.3% drop. It went on to drop another 87 points, or 6.5% over the next 11 days. Total drop: 8.2% in 32 days. Fourteen days after the 10/11/2007 high, that market retraced 72% of its then 7.2% drop. It went on to drop another 117 points, or 8.3% over the next 17 days. Total drop: 10.8% over 31 days.